He’s played a Jewish boy attending a bigoted prep school in School Ties and the object of desire of Frankenstein director Frank Whale in Gods and Monsters. He’s acted opposite legendary actors like Ian McKellen, Michael Caine (The Quiet American) and Joe Pesci (With Honours). 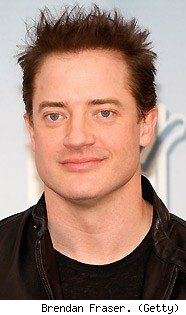 So, why does everyone still associate Brendan Fraser with Encino Man? This is the one movie that is indelibly associated with Fraser. Why? I’m just going to make a wild guess and say it’s the way he looks. I think he’s great in School Ties and still has his best performance ahead of him but, let’s be honest, he isn’t exactly a chameleon. With that rather sizable build and those enormous googly eyes and highly expressive eyebrows, Fraser looks, well, like a goofy caveman. And, from what I saw on the red carpet of Journey to the Centre of the Earth last night, he kind of acts like one too. First of all, he came out with a giant bag of popcorn. I’m happy I didn’t ask him any questions because I’m fairly certain he was probably spraying an array of kernels on every one of his interrogators. Then, every once in a while, you’d hear a bark of a laugh which couldn’t have come from anyone but the leather-clad actor. I guess he was kind of tired of the whole rigamarole because Fraser got irritated and started barking like a dog (get it? people were ordering him around like a hound?). I guess it could have been funny if he hadn’t been so obviously malicious about it. But then, hey, what can you expect from a caveman?